Cars, like houses, need constant cleaning. One particular hassle is the dust that accumulates on both the exterior and the interior. This dust cannot be wiped off with a regular cleaning cloth. With the right car duster, you can keep your vehicle super clean and looking brand new. Car dusters remove layers of dust, pollen, and other particles without damaging the car paint, polish, or the interior materials. So how can a prospective buyer find a good car duster? Does the Duster Require Cleaning Material? Material— The material the duster is made out of plays an important role in how effective it can be. 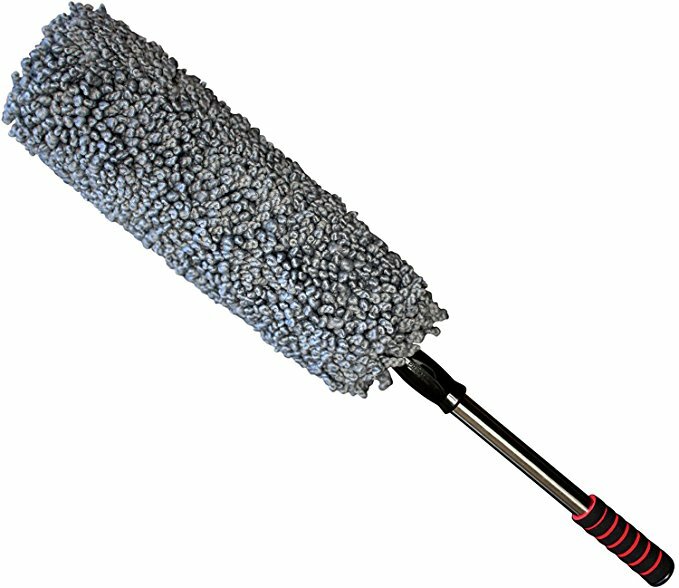 A cotton duster head, for example, is more effective and less likely to cause scratches than a plastic bristle head. Therefore, look closely at the material for both the duster head and the handle. Duster Size— Car dusters can vary in size from extra large to compact. Compact dusters are suited for interior detailing. But car owners should have at least once large duster to dust off the exterior. You don’t want to be disappointed when the duster finally arrives in the mail. So look at the size measurements without speculating about it. Shape— The shape of the duster can vary from round to flat. It’s worthwhile considering, depending on your need. Why we like it: It’s affordable, made with microfiber, and gets the job done quickly. The Carrand AutoSpa duster is surprisingly affordable, decently sized, and promises excellent performance. It’s hard not to like this car duster. This car duster is made with chenille microfiber noodles. Microfiber is considered the best material for use on cars because the cloth does not cause any scratching. And chenille microfiber is one of the best-quality microfibers you can get. The noodles are fat and long. The grey colored dusting head is rectangular shaped and is attached to a short handle. The whole duster is about 6 inches long. The handle is molded to be comfortable to hold. The duster is intended for detailing. The design of this particular car duster ensures that it can grab dust from all sides. The noodles are plush and longish, so they don’t miss much. This duster grabs at debris like a magnet. A quick wipe would be enough to remove a whole layer of dust. Then, shake the duster off to the side and it will be ready to go again. Several quick wipes are enough to leave the interior of the car dirt-free and shiny. This works especially well on dashboards and seats. This duster is perfectly safe to use on car paint as well. The microfiber noodles are very soft and washable. The duster is quite compact. It can be easily stored inside the glove box for a quick wipe. However, the compact size can be a problem when it comes to thorough dusting sessions. The handle is barely long enough to fit in an adult hand. So it doesn’t really offer flexible movement. The short handle is problematic when trying to dust hard-to-reach places, like the middle area of the bonnet. But that’s the only issue we encountered. This is a wonderfully soft, safe and convenient auto duster. It’s suitable to use on all sensitive surfaces of the vehicle, such as the paint. The duster is compact and washable too. There’s only one downside: a short handle, which is not much of a downside at all. Why we like it: This slightly expensive duster does an excellent streak-free job. Great for cleaning pollen off the car in spring. 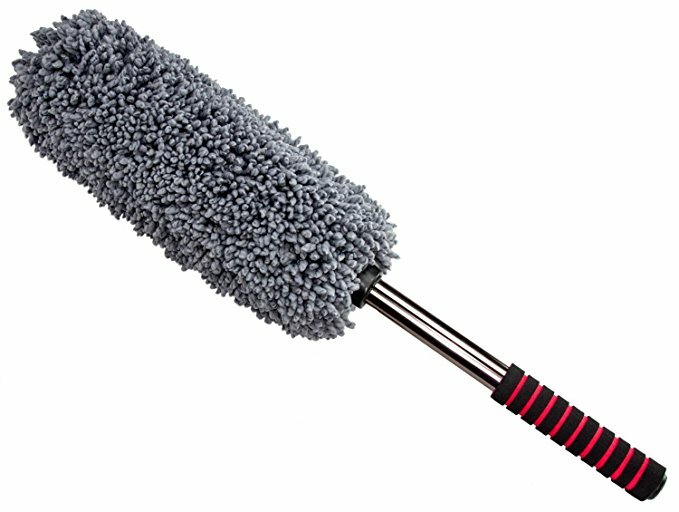 This is a 360-degree duster with a long handle and a solid grip. It’s made from microfiber and is completely lint-free. 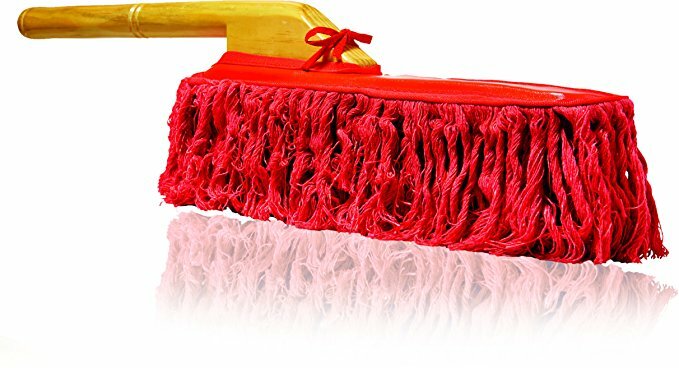 Though a bit pricey for a mere duster, it works amazingly well and has many satisfied customers. The Relentless Drive duster has a cylindrical head with microfiber cloth wrapped around it. The dusting surface turns all 360 degrees. The duster is also considerably long—it’s 16 inches long with a generous 6-inch handle. The microfiber dusting head has numerous short noodles. The handle is made from steel. Unlike wood, there’s no risk of breaking off or decaying after prolonged use. The microfiber dusting head has some electrostatic quality to literally attract dust and similar particles. The duster comes with a storage bag to protect the dusting head. We instantly liked this duster thanks to the 360-degree head. It’s perfect for removing dirt and debris off the surface of the car paint. The duster is long and big enough to get the job done without leaving the user exhausted. The microfiber head instantly grabs dust and does a very effective job of removing it. We found this duster to be particularly effective against pollen. It gets the job done with one or two swipes easily. You won’t experience any streaking with this duster, even when its used on windows. It’s very soft on the surface. On hard surfaces like the dashboard, two or three swipes would leave it shining. We absolutely loved the handle of this duster. It’s very sturdy and has a solid grip supported by a plastic anti-slip protector. The handle is extendable up to 6 inches. That is super useful when dusting different parts of the car. Once the dusting is done, shake the duster several times to dislodge the debris. This duster can be washed but it’s not necessary. If washing, use lukewarm water and a mild detergent. Do not put this in the machine because it would distort the microfiber noodles. There are almost no downers with this product. However, durability is an issue. The duster doesn’t really last as long as it should, considering the high price. This is a superb duster that really stands out. 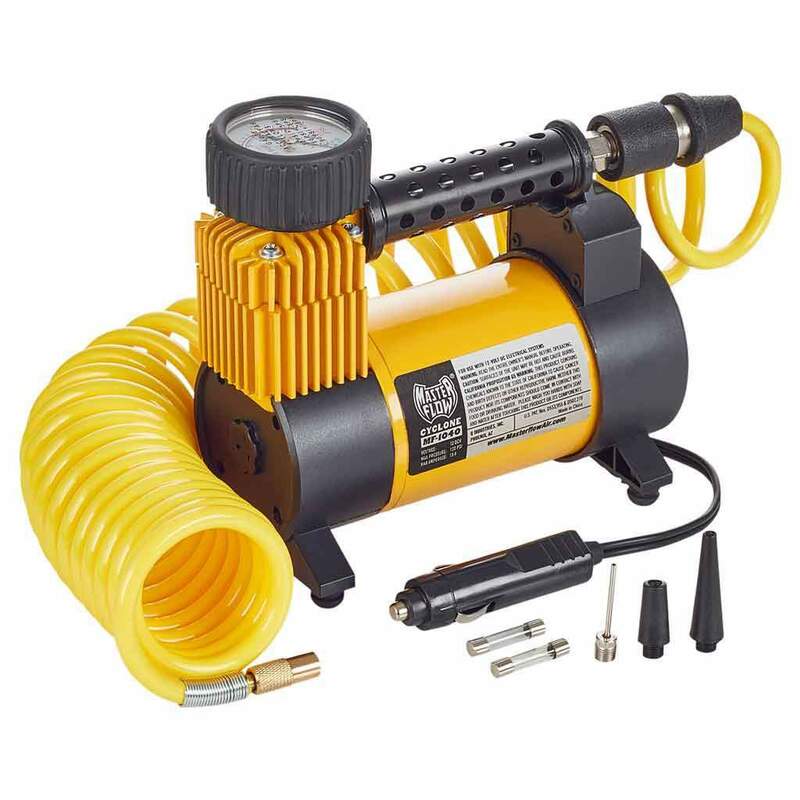 It rotates and has an extendable handle that makes dusting any vehicle convenient and easy. It’s slightly more expensive than the usual fare, but the convenience can make up for it. However, don’t expect this product to last long. Why we like it: This classic car duster is still a strong performer even in the age of microfiber. The California car duster is regarded as many car owners as the “original” car duster. This product was immensely popular before microfiber dusters came around. And even now, this is one of the best all-around performers that car owners can rely on. 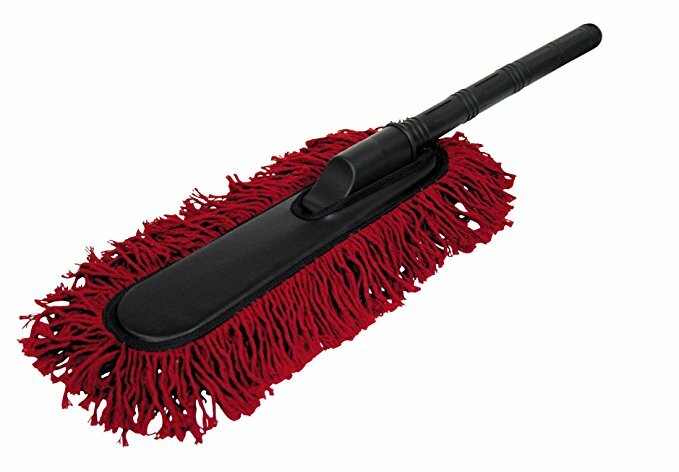 The California duster is made from cloth with a wood handle. It’s kind of like a shoe shining brush with a handle and no bristles. The long rectangular head has cloth noodles attached to it like a mop. The cloth is 100 percent cotton coated with a special paraffin wax. The wood dusting handle is completely non-toxic. A clear, vinyl storage bag is included with the package. Originally made for Californian drivers, this duster removes the need to constantly wash the car during dry summer seasons when dust is truly a menace. Despite the rather simple build, this duster is amazingly effective at getting all the dust and debris particles off the car. It works spectacularly well on well-treated car paint. The cotton dusting head lifts particles off the vehicle surface with just a few swipes. There’s no need to use spray waxes or water with this duster. Though the dusting head is cotton, it’s treated with a wax that can be as effective as electrostatic microfiber. Cotton is typically highly absorbent. But this treated cotton won’t absorb moisture, it would lift it off. On an important note, this duster requires some priming. Right off the new packaging, it would leave waxy residue and a layer of red lint on the car surface. The red lint is a pain to take off. You might have to either vacuum it off or use a leaf blower. But that completely undermines having to use a duster in the first place. To prevent such a disaster, leave the duster of a newspaper or a brown paper bag for at least 48 hours for the excess wax to get absorbed. You can start using it afterward. However, do expect two or three uses before the lint stops getting on the car. There’s something to be said about the wooden handle too. It’s very sturdy and offers a comfortable and ergonomic grip. This is the car duster that everyone used before microfiber alternatives started showing up. It still works well compared to microfiber dusters. The California duster lifts particles off the vehicle and doesn’t require any rigorous work. While there are some issues with lint, it goes away after several uses. Why we like it: The microfiber head with a telescopic handle delivers quick and wax-free performance against dust particles. 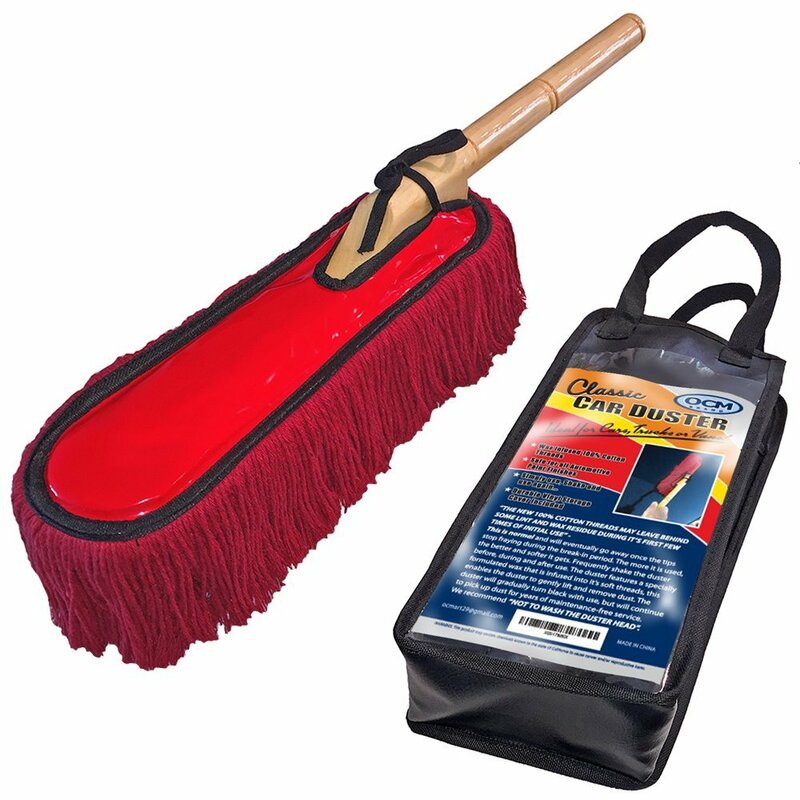 This microfiber duster presents itself as a modern alternative to the classic California cloth duster. Spoiler alert: We can’t really say which is better. It depends on the performance and preferences of the owner. In any case, the Prestige car duster is really worth checking out, especially if you want an anti-cloth duster. This car duster has a 36-degree cylindrical head covered in small and short microfiber noodles. The dusting head is gray in color so it’s easy to notice discoloration. A big plus point of this duster might be the telescopic handle with a rubber grip at the end. The handle is steel so there’s no risk of it bending or breaking. The handle is also generously long by about 6 inches. The brand claims this duster is designed to be “better” than the California car duster. We tested it to check this claim. We found this duster to be more or less similar to the Relentless Drive Ultimate Car Duster reviewed above. The microfiber duster head is slightly different as Prestige has shorter noodles (more like nodules of a wool carpet). The duster doesn’t require much sweeping to remove dust. The brand claims one swipe is enough to clean a surface of a car. But that really depends on the amount of dust present. If you haven’t washed your car in a while, you will need two or three swipes to get a shiny, glittery auto body. One major advantage of this duster is the handle. 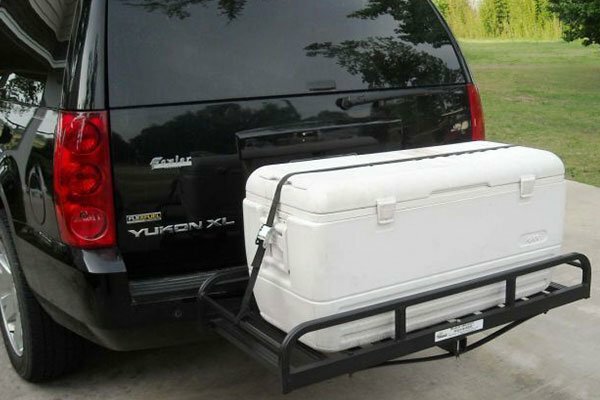 It’s long enough to reach the middle section of the car roof without any excessive reaching or bending on your part. It’s highly convenient this way. The reach is as long as 31 inches. The handle is stainless steel too. The duster picks up pollen and similar debris particles thanks to the electrostatic charge in the microfiber. The duster head can easily gather static and trap dust, instead of moving it around the surface like a regular duster. As for the comparison to California duster, that would depend on personal preferences. The microfiber has its advantages, as does cotton. This duster can cause smearing if particles are not immediately picked up by the cloth. There are no lint or wax problems with this one for sure. The dust head can be a bit stringy. If the car has layers and layers of dust, this may cause scratches on sensitive surfaces. Also, the handle is really stiff and not flexible. Though this microfiber duster has its problems, it is a solid purchase overall, thanks to its tremendous performance. Why we like it: It’s a large cotton car duster and a great alternative to all the microfiber versions out there. 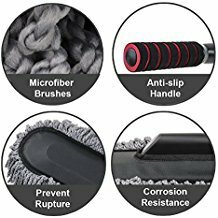 If you are unsatisfied with the microfiber car dusters out there, this is a great alternative to consider. This duster is very much like the famed California car duster. But the products differ in price and in other minor ways. This car duster is really noticeable because it’s massive. The OCM sports a large duster head that is long and narrow. The duster head is all threads made from 100 percent cotton. Each thread is about 3 inches long so this duster is truly massive. The handle is made from varnished solid wood. It’s gorgeous as it is lightweight and ergonomic. The duster comes with a slip-on storage cover. This car duster works much like the California duster. Except that this one is slightly bigger. The threads are longer, so this duster can reach into all those nooks and crannies the microfiber dusters miss. It’s great for using between washes and getting the dust off the vents and similar places that are hard to reach. The cotton threads are waxed to prevent damage to car polish and paint. The wax can be annoying at first and cause streaks. As with the Cali duster, allow this one to dry out for about 2 days. There might be some wax residue on the first two or three dustings. Expect some lint with the initial dustings as well. We loved the handle, which is crucial for getting a showroom finish after each dusting. The handle is wide enough to grip easily for long dusting sessions. It’s also lightweight, doesn’t slip out, and fits in the hand nicely. This duster works well on most car surfaces apart from the shutters. It can leave streaks and dust particles on the windows so use something else on these. The duster cannot for washed, unfortunately. But a shake or two can get rid of any trapped particles. We loved the performance of this duster, which is very much like the more popular Cali duster. The OCM is more readily available online compared to the latter. It’s a great duster that leaves the car looking shiny and new. The price is considerably cheap and worthwhile considering how big this duster is. 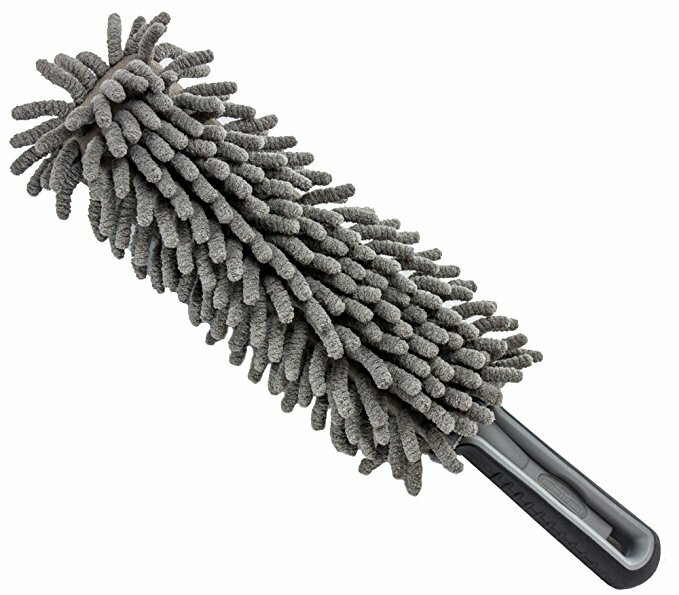 Why we like it: This microfiber car duster has longer threads than usual for products of this type. Most microfiber dusters have short noodles or nodules. Not this one. The Dusterior car duster is like a microfiber version of the California cotton car duster. It’s affordable and very promising. This car duster’s head is made from superfine microfiber. Instead of the typical mitt-shape, the fibers hang out in long threads about two or three inches long. The head is attached to a retractable handle. The duster handle is 15.7 inches long. It’s retractable from 17.7 to 11.8 inches. The handle is stainless steel and there’s a fat rubber grip at the end. The duster comes with a storage bag. This car duster is notably designed like a cotton thread duster. So does it work similarly? Not exactly. However, the duster does do a good job of removing thin layers of dust. One or two swipes is enough to trap dust and pollen. The microfiber doesn’t cause scratches. However, the cleaning capacity is really limited compared to the cotton versions. It removes some dust, but after a while, it just pushes the dust layers around. The cleaning is just not as good as the cotton versions of the duster. 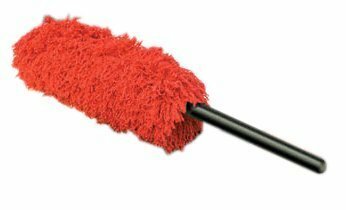 Microfiber dusters work best when there are thick noodles or nodules on the duster head. However, this duster is still useful because it works instantly. If you are OCD about wiping your car every day, then the Dusterior would be perfect. It’s just as effective as other dusters when it comes to removing thin layers of dirt. The handle is really great because it’s extendable. No more back bending to reach the top of the roof or the bottom parts of the car. The microfiber isn’t washable. It has to be shaken off to clean. After a while though, dirt gets trapped between the threads and the whole duster needs replacing. The Dusterior does a generally good job of removing superficial layers of dust off the car. It doesn’t cause streaking or similar issues. However, it’s not great for removing thick layers of dust. Plus, the duster needs to be replaced after several months of use because it’s not really washable. But this car duster is worth the trouble because it’s so cheap overall. Why we like it: This duster has long and very flexible threads that do an excellent job of cleaning. This Carrand duster is uniquely designed. It’s a cotton thread duster but doesn’t copy the most common designs around. That’s what makes this really worth the price, in our opinion. This duster has a long and narrow duster head with cloth threads attached. The threads are made from cotton. The cotton is treated to trap dust but the brand doesn’t specify how. It might be with wax but it could also be a synthetic version of natural beeswax. This duster comes with a storage bag. Its handle is about 5-inches long. Its’ not too long, but it’s not short either. The duster handle is made from hard plastic. What we really liked about this duster is how all the cotton threads face different directions. It’s not like the typical cotton car duster where the threads are unidirectional. This feels more like a cotton mop that can really be taken to task. The treated cotton threads are really great and work with one or two swipes. It doesn’t scratch the paint or cause any streaking issues. Unlike other cotton car dusters, this one does not leave any waxy residue. However, initial usage does leave some red lint. The handle is very sturdy because of the plastic material. Our only complaint is that this duster is really compact. It’s very small compared to other cotton dusters. The small size is suitable for interior dusting and detailing, though. This duster is super budget-friendly and gets the job done quickly. It’s not as big as other cotton dusters but works very effectively. Why we like it: This Relentless car duster is superbly compact and is designed specially to get rid of all those layers of dust from the dash. Most car dusters are designed for the exterior to get dust and pollen off the car paint. This duster is specially designed for the interior of the car, particularly for the dash. All car owners know the difficulty of keeping the dash clean, which gets dirty even faster than the bonnet. This car dash duster has a massive duster head and a short handle. The duster head is cylindrically shaped with medium long microfiber chenille threads. The shape gives 360-degree cleaning access. The handle is made from plastic. It’s short and is only about 2 inches long. The entire duster is only about 10 inches long. The relentless dash duster is quite wonderfully sized to fit in the car interior. It’s not too big to fit on top of the dash and it’s not too small either. The compact design is quite perfect because you can keep the duster in the glove box for access anytime. You can literally dust the dash while waiting in traffic. The microfiber does a great job of removing layers of dust off the dash, at least initially. It’s actually great for removing dust off any part of the car. It’s too small to clean the exterior without breaking the back. But it’s suited for cleaning seats, the window sills, and A/C vents, and other similar parts as well. The thick microfiber noodles trap dirt very effectively. There is no streaking or lint residue left behind. The material is electrostatic. One major problem is that too much static can build up on the dash. In that case, there will be more dust left on the dash. This duster isn’t really washable. You can shake it off to get rid of buildup. However, the buildup eventually accumulates and the duster will require replacing. This is a decent product to keep the dash conveniently dust-free. Don’t expect it to work miracles. It works well initially but needs replacement due to buildup. Considering the duster is cheap, replacement isn’t a major hassle. Why we like it: This California car duster is massive and cleans in all directions, leaving the car looking factory new. This California super duster is one of those rare products that can live up to its name. It’s massive and sports a different design than the traditional Cali dusters. This duster is designed for large and tall vehicles like SUVs, RVs, and trucks. Car owners can also greatly benefit thanks to the massive design. The duster has a rounded mop-like head covered in cotton threads. The cotton is treated with a baked-on wax. Unlike the stiff wax in the classic Cali duster, this wax feels more oily and thin. The duster has a long, 30-inch handle made of plastic. The duster is very safe to use overall and is non-toxic. We liked the massive size of this duster right away. It’s easy to get a car clean in a matter of minutes because this is big enough to clean the dust off with one or two swipes. This duster has a unique rounded head that makes cleaning possible from all angles. Unlike with unidirectional duster heads, this one doesn’t leave swirls. The wax on the threads doesn’t streak like in other cotton dusters either. However, we do recommend giving it some trial runs because it can leave lint residue. Using this duster is convenient but users have to be careful. Use this duster only on layers of dust. Avoid using on silt or sand because that would cause scratching. Also, avoid using it to wipe off things like bird droppings because this duster is not washable. A gentle glide with this duster works the best. Scrubbing causes the wax to come off and streak the car. Also, pressing too hard may cause scratching. This duster is very long lasting so the price is well worth it. We were supremely happy with this car duster as a detailing tool. Its large and desirably rounded mop head will quickly and effectively leave your car looking shiny. With the right use, this car duster can offer excellent detailing quality right at home. Why we like it: We couldn’t find a better car duster to get inside vents to remove dust and debris. This product is very cheap. For less than $10, buyers get three tiny car dusters specially designed to get inside vents and similar areas of your car. We liked it for the specific function and unique design. This car duster has a double-ended design. On one end, there is a microfiber cleaning cloth shaped like a rectangle. And on the other end is a brush with plastic bristles. It’s designed to brush off dust and wipe the vents clean. The 2-in-1 duster is very small. It’s tiny enough to get inside the speaker and A/C vents of vehicles. It’s suitable for an air vent of any size. The duster handle is in the middle section and is made from plastic. Each part of the duster is removable. Effectively, the duster can be detached into three parts for additional convenient use. This is a nifty multifunctional brush that we liked for dusting off the vents. The idea behind this microfiber brush is great, though the execution doesn’t always fall through. You can use this car duster to either brush the dust off vents or to clean other surfaces. The microfiber cloth is small enough to reach inside the vent. But it doesn’t always go right in. Also, though the cloth is labeled as microfiber, it’s not as effective as high-end versions. This car duster is not very high-quality so don’t have lofty expectations. The brush has plastic bristles that are really stiff. 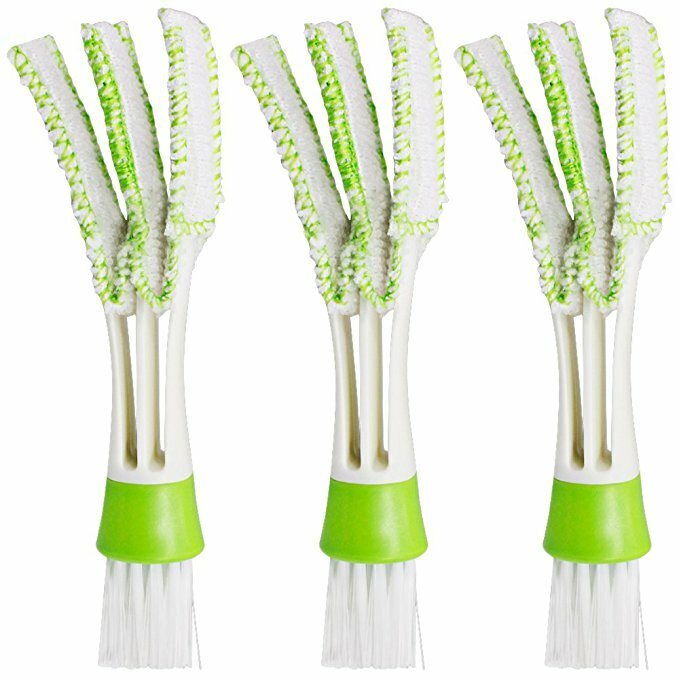 The brush part is remarkably durable and the bristles don’t shed. Each part is removable and washable so that’s a major plus. But be careful when using the brush because the hard plastic in the bristles can cause scratching. Though this car duster is designed for the vents, it can be used to remove dust from the buttons, shutters, or other small crease-like areas inside the car. This is very much a 50-50 purchase. On one hand, this duster can reach places that larger car dusters cannot. It’s affordable, washable and quite durable. On the other hand, this product is not particularly well-made. If you are not careful, it may cause scratching. Cotton and microfiber duster heads. Cotton car dusters are associated with the revered California brand. Nearly all of the other brands now use microfiber cloth. Yes, this is the same cotton as the fabric your clothes are made out of. 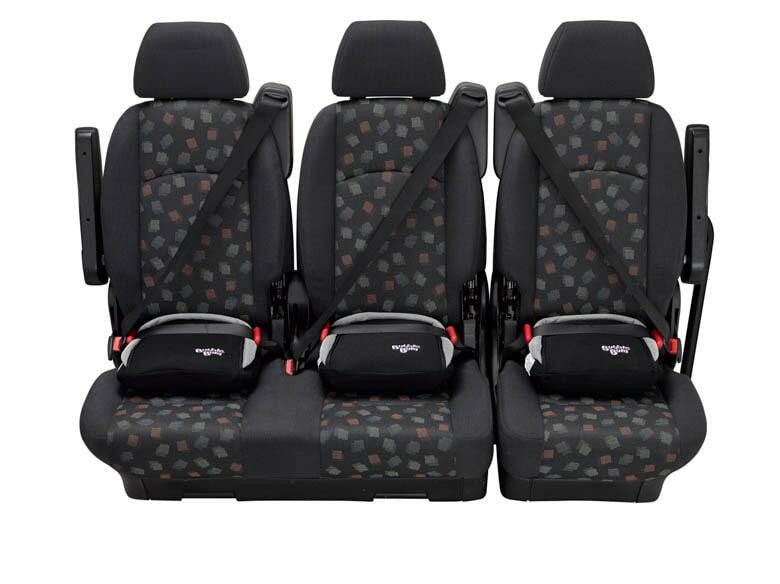 Cotton is a very soft material so it’s a great choice for car dusters to prevent scratching. However, the cotton in car dusters is not just cotton. Because this natural fiber absorbs water quickly and can cause lint issues, the cotton threads in car dusters are coated in wax. Some brands use natural paraffin or beeswax and others may use a type of synthetic wax. This wax coating prevents the cotton from causing any scratches. The wax also helps the cotton attract and trap dirt. Plus, the lint issues are largely handled by the coating. The best-known car duster in the world, the California Classic, is made from waxed cotton threads. This material can be highly effective, though it’s not without its downsides. The main downside to cotton car dusters is that these cannot be washed. So you really have to be careful about what you wipe off. For example, avoid cleaning bird droppings with them. The wax coating can cause streaking if the car duster is new or becomes heated. Some lint is inevitable. But these problems are largely limited to first-time use. Microfiber is a very popular synthetic material used to wipe everything from cars to prescription eyeglasses without causing scratches. Unlike cotton, microfiber has a higher electrostatic grade. Thanks to that, this material can attract and trap dirt very effectively. You will find microfiber in car duster heads attached as noodles, lumpy nodules, and very rarely, as long threads. Microfiber noodles can get rid of a layer of dust with one or two swipes. Unlike cotton, microfiber isn’t waxed so it doesn’t cause streaking. This material is also washable due to this. Microfiber works on the car windows as well as on car paint. However, the effectiveness of the material will depend on the brand you choose. Some brands offer high-grade microfiber duster heads that work very well. There are brands where microfiber car duster heads won’t last that long or be as effective. It’s recommended to try out a duster of both types and see which works best for your car. Not all car duster heads are shaped the same way. But does the shape really matter? Some dusters have long and narrow heads. Others are rounded or square-shaped. There are also cylindrical shaped car dusters. A long, narrow car duster head offers excellent reach when dusting off. The square or rounded heads may take longer to remove the dust layers. With rounded duster heads, you might be tempted to rub down surfaces and use them as a waxing cloth. Don’t. Rounded car duster heads work like narrow-headed ones, expect that the user can benefit from the 360-degree cleaning angle. A circular or barreling motion can quite effectively get rid of thicker layers of dust. A short handle can prove to be problematic when you are trying to dust off the exterior of the car. What happens when you can’t reach the rooftop? A longer, comfortable car duster handle is crucial for an effective cleaning session. You may prefer shorter handles when dusting the interior. A compact car duster with a short handle is worthwhile if you want to store the duster in the glove box or similar storage compartment inside the car. A good car duster shouldn’t require any cleaning material like water or a detergent solution. In fact, using cleaning material may cause scratching and other damages to the paint or car polish. Therefore, if a particular car duster you have in mind requires any cleaning agent, avoid it. A washable car duster is great for longer use. If you are wiping off liquids or bird droppings, you would want a washable product. Car dusters with threads coated in wax are not washable, unfortunately. Most non-coated microfiber material duster heads are washable. However, the microfiber may lose its effectiveness in the long-term with washing. The duster heads will have to be hand-washed because a washing machine would render it out of shape. If you are just dusting, there’s no need to wash the duster at all. Shake the duster off or gently tap it against a wall to dislodge the dust particles. Streaking issues can occur if the dusting is done incorrectly, or if the duster has a coating that gets on the car. When using wax-coated dusters, make sure the duster is not too hot during cleaning sessions. This can happen when you use the duster on a hot day. Some streaking due to excessive wax is common when the duster is right out of the packaging box. With use, the excess wax would go away. You can also try leaving the car duster on a newspaper for two days to get rid of the excess wax. When dusting, avoid rubbing or scrubbing the surface of the car. This can cause streaking and worse damage, like scratching.